We’ve heard repeatedly that things like audo (and video) components are increasingly important to a blog’s success these days. For bloggers who are put off by the need to buy or carry extra equipment, however, getting started with podcasting may seem a little daunting. If that sounds like you, or even if you’re already an avid podcaster who wants to make your show more mobile, this guest post by Chris Christensen about a new bit of portable recording gear may be of interest. Starting with the early days of podcasting back in 2004 there has been a desire to take the whole show on the road, or even into the air. Adam Curry, the “Podfather”, is also an airplane pilot and would take a portable recorder up in his plane to record episodes of his show “The Daily Source Code”. Other early podcasters would also take a recorder out into the streets to create what became known as a “soundseeing” tours. Of course, this is not anything that radio had not done decades earlier, but podcasting was putting the tool of portable audio in the hands of of thousands of new audio creators. The portable recorder of choice back in 2004 might have been an iRiver MP3 player or an Edirol portable recorder. Later devices like the Zoom H2 would also become popular. All had two things in common – awkward user interfaces and the need to carry yet another gadget. With the ubiquitous nature of smartphones like the iPhone, these specialty recorders are being eclipsed by solutions built around the gadget that many of us are already carrying. 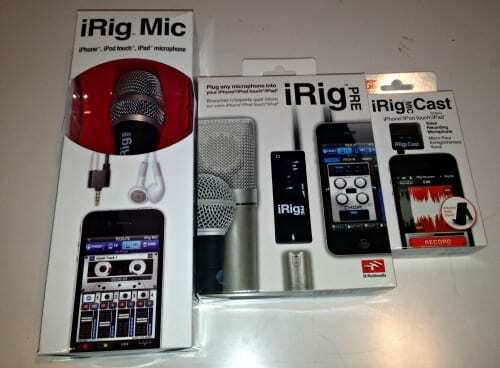 iRig has released a series of 3 microphones that work with an app on your iPhone to create a portable recording studio. IK Multimedia was kind enough to send me these three solutions to review. The smallest of these microphones is the iRig Mic Cast ($39.99). This small microphone plus into the mic jack on your iPhone, iPod Touch or iPad and provides a better microphone than the built-in microphone for recording sound. The iRig Mic Cast is a definite improvement over the built-in microphone but the differences are not as obvious as one of the other two solutions. But what this solution may lack in audio quality it makes up for in its small size. This is a microphone that is small enough to always have with you. It is small enough to fit in the change pocket of a pair of blue jeans. The big problem you could have with this mic is remembering where you put it. The iRig Mic Cast also comes with a simple stand so that you could use it to record a class, and interview or a recital. You can plug in your earbuds into the Mic Cast to monitor the recording levels. The big brother, and possibly my favorite of the iRig products, is the iRig Mic ($59.99). Like the iRig Mic Cast, the iRig Mic will record audio from an iPhone, iPod touch or iPad and it also provides the ability to plug in your ear buds so that you can monitor the sound levels. But the iRig Mic looks like a standard studio microphone. Add a microphone flag with the name of your podcast and you are ready to hit the streets doing “man on the street” interviews. Combine it with the video capabilities of an iPhone and you are ready to make that a video report. Like the iRig Mic Cast it plugs into the mini jack at the top of your old iPhone or the bottom of your iPhone 5. It provides a fuller, richer sound to its little brother, but this is a microphone that you will have to throw in your backpack or briefcase. It is not pocket sized. For serious audiophiles, the 3rd solution from iRig is the iRig Pre ($39.99) which is not a microphone but a pre-amp that let’s you plug in an industry standard XLR microphone into an iPhone, iPad or iPod Touch. I see this as a better option for the budding musical performer who wants to record that new song on the tour bus. The iRig Pre can provide 48V of phantom power for condenser microphones and is powered by a 9V battery. The manufacturer promises 30 hours of life off one battery, or only 10 hours if you are using it to provide phantom power. (If you think phantom power is something that you only get around Halloween, then this is not the right solution for you.) I have not had a chance to compare the sound quality of this solution as I don’t have an XLR microphone lying around. With all 3 microphone solutions, IK Multimedia provides free recording applications like iRig Recorder and this is the only part of the solution that I thought needed some work. The user interface of the application looked like something designed by a hardware engineer rather than a UI designer. I also ran into some problems getting the iRig Mic to work reliably with the built-in app, but did not seem to have the same problems with some of my favorite audio recording apps like Audioboo or Voice Memos. So while the hardware is one of the better audio solutions I have seen for the iPhone, for now I would recommend looking around at other software solutions. The only danger I see with the iRig is that I may spend time sitting in my room talking (or singing) to my iPhone just like I did when someone made the mistake of giving me a tape recorder as a child. Perhaps that’s all part of the journey of becoming a podcaster. Author bio: Chris Christensen is the host of the Amateur Traveler, a popular online travel show that focuses primarily on travel destinations. It includes a weekly audio podcast, a video podcast, and a blog. By day he works at PayNearMe.com where they create products to help people without credit or debit cards pay for things. Chris was formerly the Director of Engineering for TripAdvisor’s New Initiatives group, the EVP Engineering at LiveWorld which runs online communities like those for eBay, HBO, and American Express, and a Software Manager at Apple, Momenta (pen computing) and HP.